First round will take place online on the website of the competition between 15th January to 5th May 2019. During this period the participants can send their video applications to the competition address. After the completion of applications an international jury will meet and grade the videos. 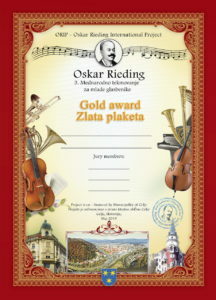 All the participants will receive a certificate for participation at the 3rd International Competition for Young Musicians Oskar Rieding. The citations and certificates for participation will be sent to participants by e-mail. A pedagogue and a piano accompanist will also receive a certificate for participation of a student at a competition. is given to the competitors who achieve between 90 and 100 points. is given to the competitors who achieve between 80 and 89 points. The gold award winners from all categories will go to the finals. The finals will take place on 24 May 2019 in the National Hall in Celje, Slovenia; on the same day after the finished final performances there will be the award ceremony for discipline – VIOLIN. Solemn proclamation of the final winners of the 3rd International Competition for Young Musicians Oskar Rieding (discipline – violin) will be on 24 May 2019 at the National Hall in Celje, Slovenia. The finalists will receive their prize in person at the award ceremony. special prize from Viva La Musica Avgustin d.o.o. special prize from Music boitique NOVA LASTRA.